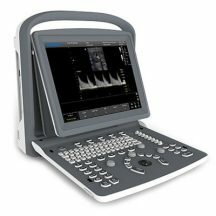 Detail Produk "USG Chison Sonobook 9 Vet"
The New Chison SonoBook 9 laptop-style ultrasound machine is Chison’s most advanced portable cardiovascular ultrasound machine. Its most notable breakthroughs are with advanced cardiac and vascular imaging. 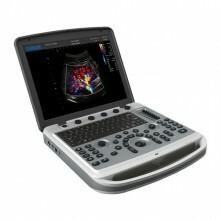 However, the SonoBook 9 also operates as an excellent shared service portable ultrasound. With an internal Solid State hard drive, the SonoBook 9 portable ultrasound machine is among the fastest machines we tested. Saving loops, changing modes, adjusting image quality, exporting, et.c, are all nearly instantaneous, with almost no lag keeping long line clips (prospective and retrospective). The SonoBook 9 has a durable build and includes many advanced imaging features including compound imaging, needle visualisation, stress echo, speckle reduction imaging, IMT, Tissue Doppler, and prospective/retrospective cine loop saving. This is Chison’s first laptop-style system, and it’s built with durability and portability in mind for a mobile shared service ultrasound machine. We find the durability and design to be similar to Mindray and better than offerings from GE’s Vivid and Logiq portable ultrasound machines. The new Chison SonoBook 9 also carries an extended warranty, which gives it a definite edge over new or refurbished similarly priced offerings from other high-end advanced portable cardiovascular ultrasound machines. Two years warranty for 2D probes, 4D probes & highest frequency linear probes have 1 year. Abdominal, Anesthesia, Cardiac, Cardiovascular Imaging, General Imaging, Interventional Procedures, Intraoperative Procedures, Musculoskeletal, OB-GYN, Pediatric, Peripheral Vascular, Portable, Small Parts, Stress Echo, Superficial, Thyroid, Transcranial Doppler, Urology, Vascular, Venous.